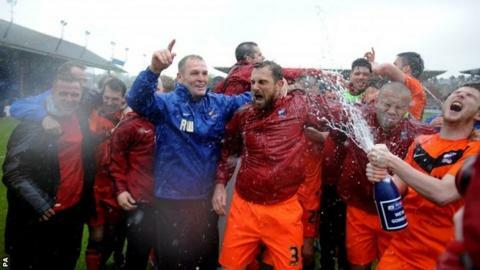 Scunthorpe were promoted from League Two despite boss Russ Wilcox's record unbeaten start to a managerial career being ended by Exeter City. The Iron had been undefeated in Wilcox's previous 28 games at the helm. Craig Woodman fired into the top corner from 25 yards for his first ever Exeter goal to give City the lead. Jimmy Keohane doubled the advantage after the break as keeper Sam Slocombe fumbled his low effort from the edge of the box and it crept over the line. But, despite the loss, the Iron still gained automatic promotion after fourth-placed Fleetwood drew at home to Southend United. The result also ended Exeter's slim fears of relegation from League Two, and was just their sixth home win of the season. Woodman's strike was the highlight of an otherwise forgettable first half as the left-back got on the end of a free-kick played square across the edge of the box from Matt Oakley. Scunthorpe had their best chance six minutes after the restart as Sam Winnall headed over from six yards after a cross from the right. Keohane then struck as the impressive Irishman picked up the ball 25 yards out before advancing unchallenged to the edge of the area where his relatively tame low shot was fumbled over the line by Slocombe. Exeter had an appeal for a penalty turned down by referee Trevor Kettle when John O'Flynn's 57th-minute strike was blocked by a the arm of a sliding David Mirfin. Eliot Richards and Liam Sercombe had chances from distance for City as the second half drew to a close. "We're all delighted. I don't want to touch on the game too much because that was really disappointing, but obviously the bigger picture is we've got the club back up to League One at the first attempt which is an outstanding achievement. "There have been periods this season where I've had to make big decisions and big changes. "Some players have been disappointed, but what they've channelled that into playing a huge part backing up the players that are in their shirt. "We'll focus first on York. It gives us a little time this week to sit down with the chairman and everybody else and see where we are going to take the club." Match ends, Exeter City 2, Scunthorpe United 0. Second Half ends, Exeter City 2, Scunthorpe United 0. Foul by Matt Oakley (Exeter City). Deon Burton (Scunthorpe United) wins a free kick in the defensive half. Corner, Scunthorpe United. Conceded by Craig Woodman. Attempt blocked. David Syers (Scunthorpe United) right footed shot from outside the box is blocked. Substitution, Exeter City. Matt Grimes replaces Eliot Richards. Corner, Exeter City. Conceded by Hakeeb Adelakun. Foul by Craig Woodman (Exeter City). Hakeeb Adelakun (Scunthorpe United) wins a free kick in the defensive half. Attempt missed. Liam Sercombe (Exeter City) right footed shot from outside the box is close, but misses to the left. Attempt blocked. Craig Woodman (Exeter City) left footed shot from a difficult angle and long range on the right is blocked. Tom Nichols (Exeter City) wins a free kick in the defensive half. Foul by Marcus Williams (Scunthorpe United). Attempt missed. David Mirfin (Scunthorpe United) header from the right side of the box is close, but misses to the right. Corner, Scunthorpe United. Conceded by Matt Oakley. Attempt blocked. Hakeeb Adelakun (Scunthorpe United) right footed shot from the left side of the box is blocked. Daniel Coles (Exeter City) wins a free kick in the attacking half. Foul by Deon Burton (Scunthorpe United). Substitution, Exeter City. Tom Nichols replaces John O'Flynn. Substitution, Scunthorpe United. Paul Hayes replaces Terry Hawkridge. Attempt missed. Eliot Richards (Exeter City) right footed shot from a difficult angle and long range on the left is close, but misses to the right. Attempt blocked. Jimmy Keohane (Exeter City) right footed shot from outside the box is blocked. Corner, Exeter City. Conceded by Terry Hawkridge. Hand ball by Christy Pym (Exeter City). Foul by Danny Butterfield (Exeter City). Terry Hawkridge (Scunthorpe United) wins a free kick on the right wing. Attempt missed. Eliot Richards (Exeter City) left footed shot from outside the box is close, but misses to the left. Corner, Exeter City. Conceded by Marcus Williams. Eliot Richards (Exeter City) wins a free kick in the defensive half. Substitution, Scunthorpe United. Hakeeb Adelakun replaces Michael Collins. Substitution, Scunthorpe United. Deon Burton replaces Sam Winnall. Goal! Exeter City 2, Scunthorpe United 0. Jimmy Keohane (Exeter City) right footed shot from outside the box to the bottom left corner. Attempt saved. David Syers (Scunthorpe United) right footed shot from outside the box is saved in the top left corner. Foul by Liam Sercombe (Exeter City). Terry Hawkridge (Scunthorpe United) wins a free kick in the defensive half.